To find out how to enable the power user mode, scroll down. Opera Software launched the first Chromium-based version of the company's web browser back in the beginning of July 2013. The release caused quite the controversy, with many existing Opera users being disappointed by the lack of features of which some had been a part of the browser for more than a decade before. The company promised to address several of the issues in time, and to keep an eye on the old branch of the browser for the time being until the new Opera would make a solid foundation for all users of the browser. Several distribution channels were created to provide interested user, developers and testers with access to browser features that were not yet ready for prime time. The company has released four new major versions of Opera in the meantime, with Opera 19 released to the Developer channel ten days ago. Today's update of that channel brings a new feature to the browser: the task manager. To load it, you first need to enable the Developer Tools menu with a click on the Opera button and the selection of More Tools > Enable Developer Tools. It is then possible to launch the Task Manager from the Developer Tools menu. The program looks and feels identical to the Chrome Task Manager, with two core differences. First, you cannot use Shift-Esc or any other keyboard shortcut to launch it in Opera. Second, the Stats for Nerds link is not available that leads to the browser's About memory page. The changelog lists all other changes in the release. It lists many stability improvements as well as a couple of site-specific fixes. This includes a fix for YouTube not working in the browser's Off-Road Mode, or a bug that caused Opera Turbo (Off-Road Mode) to fail to load websites. The settings page has seen a couple of changes. Probably the most important change here is the ability to change the number of columns on Opera's Speed Dial page, and also a new power user setting to hide the search box on the start page, according to the change log. 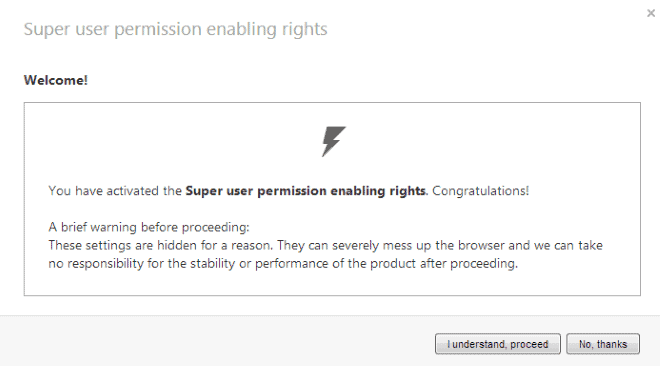 I could not find the power user settings in Opera even though the change log was making a reference to it. If done right, the following overlay screen should appear. You have activated the Super user permission enabling rights. Congratulations! These settings are hidden for a reason. They can severely mess up the browser and we can take no responsibility for the stability or performance of the product after proceeding. Click on the I understand, proceed button to enable the mode. The "Hide the search box in Speed Dial" preference is then listed under Start Page on the settings page. Here you can also enable "Always show power user settings". According to Opera Software, more options will be added for power users in the future. Opera 19 is still only available for Windows and Mac systems, so that Linux users still have to wait for the first build for their system. Opera has not released any information in regards to this, and it is not clear when the first Linux builds will become available. It doesn’t work for me.I don’t see power user options. Do you have the latest Developer Build? It was updated today. You are right, I missed UP UP at the beginning. Fixed. I wish Mozilla did something like this in Firefox rather than annoyingly removing features and settings which if you want them back, you have to install third-party addons. What? Didn’t Opera just scrap their entire browser and all its unique features only to replace it with a crappy Chrome rip off instead? Yeah, they kinda did. Might wanna get a grip there, bud. Aurora might be a dumb move, but compared to what Opera pulled, it’s pretty tame stuff. >Aurora might be a dumb move, but compared to what Opera pulled, it’s pretty tame stuff. Aurora’s a beta channel of Firefox; Australis is the much-maligned planned UI revision. Speaking for myself, I don’t really care about the cosmetic changes Firefox has up the pike. I use Stylish to change the UI anyway, so the default doesn’t matter to me. I’m annoyed because the *functionality* of the browser is being affected. Specifically, switches I use in about:config have been disabled, under the guise of protecting users from themselves. That’s all well and fine for novices, but experienced users who’ve taken the time to investigate those options and come to rely on them are being affected as well. The disabling of keyword.url, for example, severely disrupted my workflow until I found a workaround on this site. When users bring these concerns to Firefox’s developers, they are rebuffed and told to install an addon. This is bassackwards. Functionality should be added to the browser, not taken away. At least Opera is giving experienced users an option to access advanced settings. Mozilla has stubbornly refused to address the problem, assuming that the community will develop addons to correct their mistakes. In terms of which company is behaving badly, at least Opera is listening to the criticism, whereas Mozilla is burying their head in the sand. What’s the point of “Advanced stuff” when it’s not even touching the most basic features on old Opera. Yes, that’s more or less the impression the Opera a/s managed to give. Like Mr Brinkmann said above: ” four new major versions of Opera”. Much of the complaints stem from the situation that Opera 15+ is not a fully fledged browser, and that the versions are not major versions of a fully fledged browser. 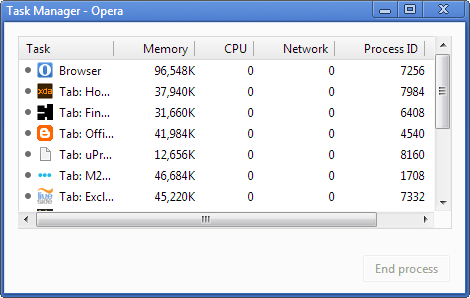 Opera 15+ is an ongoing renovation project, a migration project. Everything has been ripped out of it, and is slowly being replaced piecemeal (or so we hope). The versions we download are slowly improving downloads of the migrational platform. The point is that that was not well communicated. We all thought we were downloading a new version of a real browser, and so we screamed to high heaven when we found out. So most of the complaints about Opera are in a way missing the point – the features will be back (or so we hope). And when is that? Nobody seems to know or tell. A fair guess is from six to twelve months from now. It’s still possible to regain lost functionality via addons, but users shouldn’t have to. I don’t see why Mozilla couldn’t implement the Konami code (or even just a boolean switch) in Firefox. Internet download manager (IDM) not working with opera……. The “Hide the search box in Speed Dial” preference seems to have been removed in the latest dev build (21.0.1432.5). Do you have any idea where it is, or has it been permanently removed? I’ve been into the power user mode, and it doesn’t show up there. Win 7, 32 bit, USB install. Hm, I’m running the same version, only 64-bit and W7 Pro, and it shows up fine in my settings. It seems this hack is no longer working as of Opera Next 21 (On Win 7 Ultimate – 64-bit). Does anybody know how to do it there? I have managed to get it to work on the Stable release Opera 20, just not on the newest Opera Next 21. ..Although the Hide the search box in Speed Dial checkbox doesn’t seem to be having any effect for me. EDIT: Sorry, I’m on the stable release, so this might irrelevant for the Next users! thanks for this article! Now Opera clearly is better than Chrome.